Classic in all white and green, our florist design team have mixed a popular combination of roses and gerbera daisies with seasonal berries and fresh greenery. 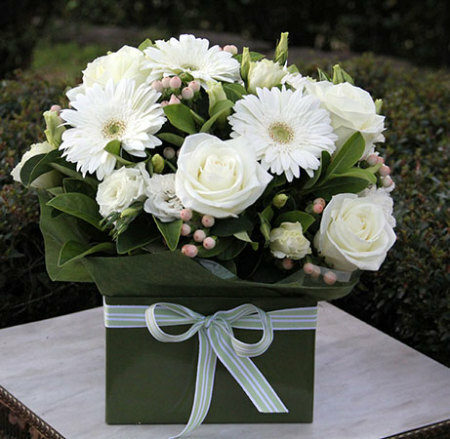 Beautifully presented in a simple gift box, this pure white flower arrangement is a winner and ideal for any occasion. 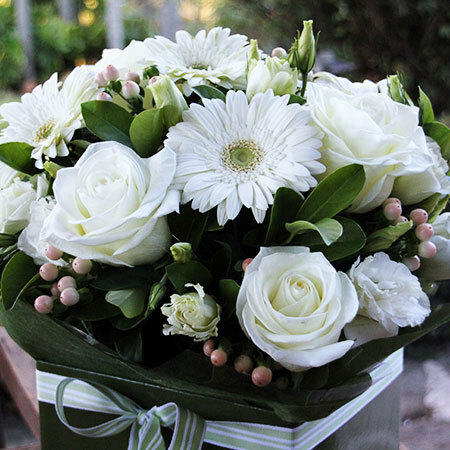 Order these flowers via our online florist shop or by calling our floral consultants toll free on 1800 66 66 46. 2018-12-18 They always have a variety of prices and choices, and the added bonus gifts are what makes it more appealing. 2017-01-18 Service rating : Great friendly and professional service. Product : Obviously I like the photo of the arrangement, but of course I have not seen this personally. 2017-01-14 Prompt delivery and good value for money. 2016-10-17 Service rating : Poor quality flowers delivered. They does within 2 days after caring them for it carefully. Situation will hopefully be rectified with replacement flowers to ensure sent. Product : Gorgeous flowers per the picture but they does within 2 days. For paying such a huge price it`s a shame the quality of flowers wasn`t great. 2016-09-23 Service rating : Very happy with the follow up service to confirm time and completion of the delivery, which was on the same day as the order. I am new to FfE and was impressed with the on-time delivery of another order this week. Product : Recipient (who just attended a funeral for a loved one) thought the flowers were lovely. Product : Excellent experience. Easy to arrange and pay. Flowers as pictured and arrived in promised timeslot. Will definitely use again. 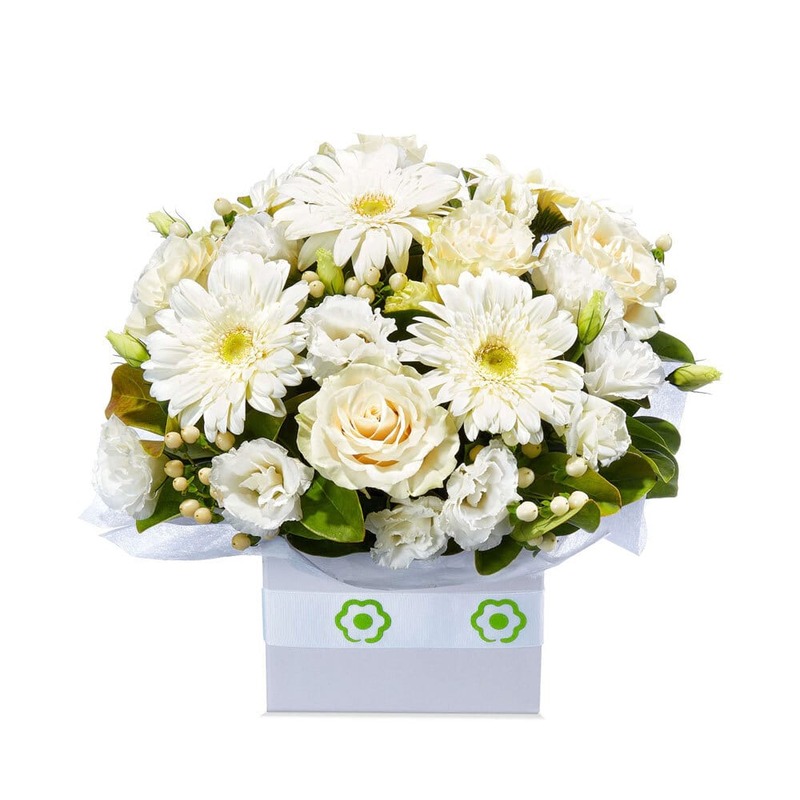 Product : Feedback from the receiver was that the flowers were amazing. I also used them about a month ago (sympathy flowers) and I was told the ones we sent were the best out of about 60 arrangements so well done! 2016-05-22 Service rating : It was incredible, I placed my order on Sunday night and it was delivered by 7pm on the Monday. During times of difficulty the last thing you want to worry about it making sure your flowers get to a grieving friend......I didn`t have to worry at all. Product : EXACTLY what the picture looked like! 2016-05-09 Service rating : The only issue i have is delivery notification. I recently sent sympathy flowers to a friend and given her situation the last thing I want to do is ask her if I she received my flowers...I have no way of knowing if they were delivered or not unless I ask...which may take a week or so. Some kind of verification of delivery would be appreciated. Product : They looked lovely on the website, but as I don`t live in the same city as the recipient I do not know what the final product delivered looked like. Previous flowers sent have always been to a high standard. 2016-04-22 Service rating : Wonderful service, easy to order online, great value for money. Product : Stunning flowers, thank you! 2015-11-12 Very happy with the fast and efficient service. Thank you.. Product : The receipients were very impressed with the flowers! 2015-08-21 Service rating : Flowers for everyone have provided us with great customer service. Product : Apparently they weren`t fresh when they arrived and died 2 days after delivery. That being said the same person received a different bunch earlier in the year and they lasted over a week so it just be a bad bunch. 2015-08-17 Service rating : efficient and simple ordering process. was delivered as promised within the delivery window. Will use again in the future. Product : fresh and beautifully arranged. 2015-08-13 Service rating : Ordering was good. Despite the email saying the flowers were delivered the person receiving has not mentioned their arrival. Due to the nature of the circumstances I am not prepared the ask them directly if they arrived. I can only assume that they did. Product : Unsure if the flowers were delivered. Despite talking to the people on multiple occasions in the last week, they did not mention anything about receiving flowers from me. I am confident if they had arrived they would have mentioned something to me. 2015-07-20 The young lady I spoke with was very helpful and I would be happy to use Flowers for Everyone again. 2015-06-05 Service rating : We were unfortunate to have a problem with our order supplied through a local agent. Customer Service promptly addressed the issue and arranged a re-delivery directly from their Sydney store. Product : Re-delivery was beautifully presented, fresh and just like the photo online. Product : The flowers were fresh and radiant and no water spilled while I was carrying them. I got exactly what I asked for. Product : This was the first time I`ve used your flowers so I`m pleased that my friend got them on time and was happy. Will use again. Product : Not like the picture on the net. 2015-04-06 Service rating : Ordered and delivered with no fuss. Product : Flowers were lovely and still looking good five days later. 2015-04-04 Service rating : The flowers were never delivered. 2015-03-16 Service rating : Flowers for Everyone have always delivered fabulous arrangements on the day requested. Would recommend to others without hesitation. Product : Arrangement was delivered as described on website. Recipient was very impressed. 2015-03-06 Service rating : Easy to order online with prompt confirmation of delivery of flowers ordered. Product : Flowers were beautiful & delivered promptly. Having suggestions for the card made it even easier to complete the process.